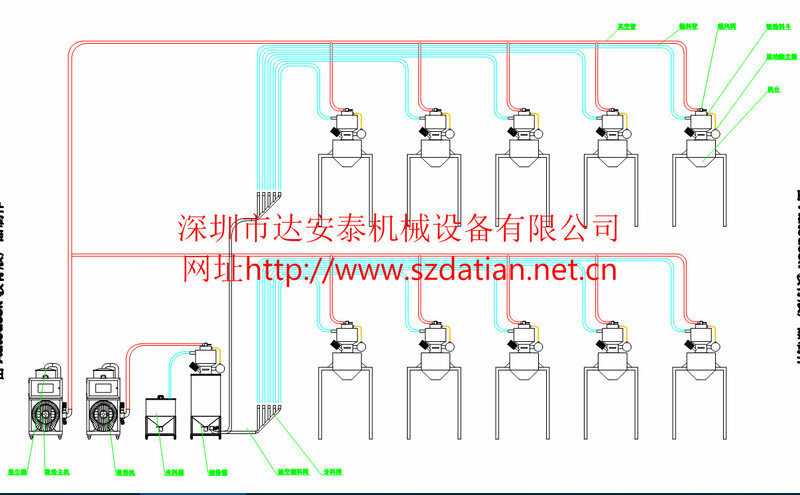 1 on the 10 powder center feeding system 承蒙 your company's sense of love to! I would like to quote the following products, please refer to the reference and benefit to care, be grateful! PLC process control, the circuit can control seven operating points, 7.5kw high pressure double fan, with dust removal device part. PLC process control, the circuit can control seven operating points, 5.5kw high pressure double fan, with dust removal device part. Adjustable air pressure, cylinder stroke speed, tracheal copper connector using PC08-2. Installed in the bottom of the storage tank, used to empty the pipe, so that the plastic does not remain in the tube. Adjustable air pressure, cylinder stroke speed. Made of stainless steel. Non-standard special, with casters casters, the bottom of the pumping. The use of joint-licensing environmentally friendly tasteless transparent heat-resistant steel pipe, for negative pressure and the machine and dust collector, vacuum station, etc. 3. Delivery mode: the above quotation for the Wenzhou delivery price. 6. Acceptance for the completion of the operation within one month of delivery, warranty period of one year. 7. The above includes education and training. 8. The above price does not include tax, tax plus 17 points.